We’ve all had one of those days where a project is interrupted because an extension cord is all tangled up or people keep tripping over it. Not only are extension cords in a garage a pain from an organizational standpoint, they can be a safety hazard. 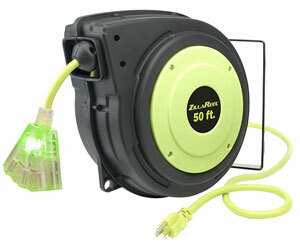 A good retractable extension cord reel offers the same benefits air hose reel users are well aware of. It can be mounted out of the way in a central location on a wall or ceiling to keep your garage tidy and you working at optimum efficiency. 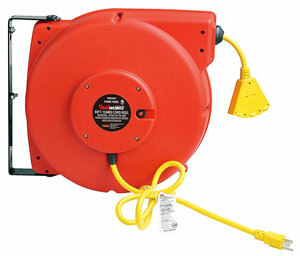 The following are some of the best retractable extension cord reels you’ll find on the market. Reels come in a variety of lengths, gauges, and housing materials. Yet they all share a common goal: to provide power to your workspace without getting in the way. These six models represent a variety of options, allowing you to choose the reel that best suits your personal needs. 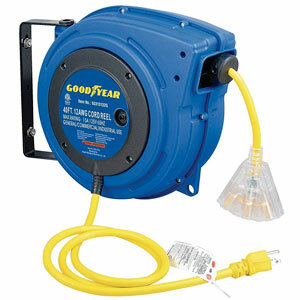 Just like our favorite air hose reel, Goodyear understands the design of a good retractable reel. While they are more known for their tires and air hoses, Goodyear makes a top notch commercial-grade retractable reel that combines durability and safety. The compact polypropylene reel has an enclosed drive spring to protect against contaminants, improved ratcheting with the ability to lock at any length or set to non-locking, circuit breaker with reset button, and swivel bracket. Inside is a 40 foot 12/3 SJTOW cord with lighted triple tap. A reinforced cord wrap helps reduce the risk of damage when tugging the cord at different angles. Finally, a 60-inch lead-in ensures the reel can be mounted in the desired location without needing any additional extensions to the wall or ceiling outlet. 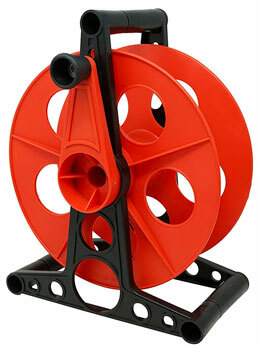 Users find this reel to be easily mounted, with high-quality retraction. The lighted female plug is also a welcome safety feature for many home users. Owners note that the heavy-duty cord lasts a long time even in rough environments. Some consumers have complained about blown fuses when using this reel. As the built-in circuit breaker will trip if 15 amps is exceeded, this problem is likely caused by connecting to an outlet whose fuse is below 15 amps. When encountering similar problems, it might be necessary to move the reel to a different circuit. The popular ZillaReel doesn’t simply sound like a monster, it proves to be one. Its 50 feet of heavy-duty oil and cold weather resistant 14-gauge SJTOW cord gives flexibility, lightness, and durability; something Flexzilla is known for. The mounting bracket can rotate 180 degrees and releases the cord in three-foot increments for improved control. The illuminated three-outlet female, adjustable cord stopper, and built-in circuit breaker with reset button make this reel perfect for almost any workshop setting. Users have run a wide range of power tools, sometimes simultaneously, through the ZillaReel without any issue. They note that mounting is easy, once you understand how the mounting bracket is attached. Length is also a major bragging point for this reel’s owners, who love being able to reach any point in their workshop. The biggest complaint about the ZillaReel is a frequently misquoted amperage. The cord is only rated as 13 amps, but sellers often market it as 15 amp, resulting in customers having constant breaker trips. When used as a 13 amp cord, there are no breaker issues. Great for a home garage but go with a higher amperage model for commercial use. This 12 gauge SJTW cord reel includes an unusual feature compared to our other picks: It can be removed from its mounting, allowing it to be both stationary and fully portable! The cord itself is vinyl-covered, providing 40 feet of flame retardant and water/oil resistant power without suffering in direct sunlight or abrasive environments. Safety features include a built-in circuit breaker, LED-lit plugs to warn when power is on, and yellow cord color for higher visibility. The female plug can accommodate up to three devices at once, making this an all-around winner. Best of all, the cord is covered by a lifetime manufacturer warranty. Owners of this cord note that it works really well, both in terms of providing power and in its ability to retract properly. The portability is an added bonus, which isn’t present in Iron Forge Cable’s light duty 16-gauge reel. However, many users do recommend purchasing your own mounting screws, as the ones included strip easily. There are two basic complaints regarding this reel. The first is that the plug-in is only one foot long, requiring many users to use a surge protector or extension cord to plug it into the desired outlet. Second, the detachable design means the reel cannot pivot, making it a little harder to angle in some situations while mounted. Built for industrial use, this “made in the USA” retractable electric cord has individually powder coated components for maximum corrosion resistance. Capable of being bench, ceiling, or wall mounted, the reinforced steel base is designed to protect against damage to the drive spring caused by reverse winding, as well as a heavy duty collector ring to ensure maximum conductivity. The male plug is designed to conduct 5-15 amp currents, while the three-prong female plug is 15 amp. An adjustable cord stop helps ensure that the 45-foot SJEOW cord is always reachable when retracted. 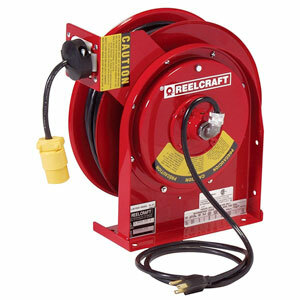 Those who have purchased the Reelcraft reel tend to still use the same cord years after purchase. The 12-gauge cord provides serious power for those using it at home, and owners who use it in a commercial environment notes that it powers their tools reliably and without any power loss. The only complaint about this reel occurs at the end of winding. It tends to have trouble retracting the last ten feet, which isn’t a problem for high ceiling mounts. Unfortunately, this may become frustrating in a smaller setting. 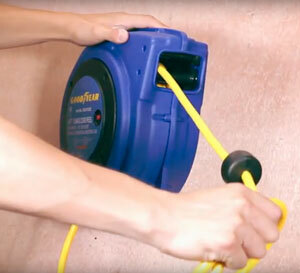 Durability is the middle name of this 12 gauge heavy duty extension cord reel. The casing is made from powder-coated steel, with a built-in eye hook for easy mounting. Its 20-foot cold weather SJTOW cord gives flexibility and functionality, even in frosty weather. A clear NEMA 5-20R grounded outlet houses a power indicator light, so you always know if the cord is live. Finally, the male plug features a resettable 15-amp circuit breaker for added safety. This reel has a fairly large following, thanks to its overall quality and safety features. Owners have used it both for home use and in commercial settings with equally positive results. The female plug illuminates well enough to see in low light, making this popular when working under a car or in other light-restricted areas. An ongoing issue with this cord has been the fit in its female outlet. The connection tends to be very loose, resulting in frequent disconnects if the cord is bumped. Some have solved this problem by carefully bending the terminal prongs while the cord is disconnected. Available in either 65 or 40 ft. length, this 15 amp SJT triple tap cord is perfect for a variety of workshop needs. 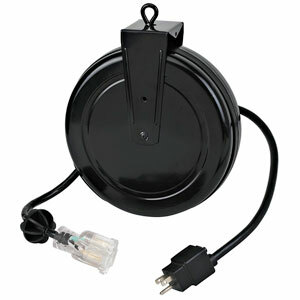 The durable, impact-resistant polypropylene housing has a swivel bracket that attaches easily to the wall or ceiling. Retraction is quick and easy, thanks to the drive spring, while the latch allows you to lock the cord at the length you want. A 60-inch lead-in makes it even easier to mount this reel precisely where you want it. Owners appreciate the generous lead-in cord length, as well as the overall craftsmanship. They note that mounting is a breeze, and the cord is easy to retract. This reel seems to have the opposite problem compared to most competitors. Customers have noted that the cord doesn’t always lock properly, and the retraction is so powerful that it can pull whatever’s plugged into it. Solutions for this problem have ranged from adjusting the drive spring tension to clamping the cord down when in use. When buying a retractable extension cord reel for the first time, you might be a little confused by all of the choices. The following tips will help you choose the best possible reel for your needs. The gauge of an extension cord does more than dictate its thickness. As a general rule, the more power you will need, the bigger the gauge (i.e. the smaller the number) you will need. Most household appliances will work off of a simple 16-gauge cord. However, table saws and major commercial tools will need a 12-gauge cord to achieve full power. Thus, it is best to look at the most powerful item you will be plugging into the cord and choose the gauge based upon that item. You might be tempted to buy a manual reel based upon cost or maintenance concerns. However, these reels are less effective in a workshop environment. They require you to manually crank the cord back onto the reel, which can limit your mounting options. Retractable reels just need a little tug to send the cord back into its housing, allowing you to put it away without ever leaving your spot in the workshop. It is the same reason many vacuum cleaners now use retractable cords instead of manually wound ones.